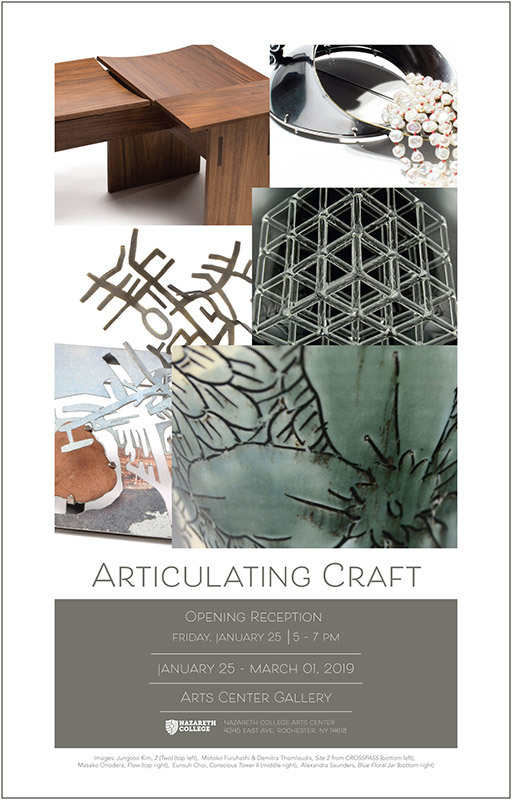 Articulating Craft exhibition announcement, Nazareth College Arts Center Gallery, January 2019. 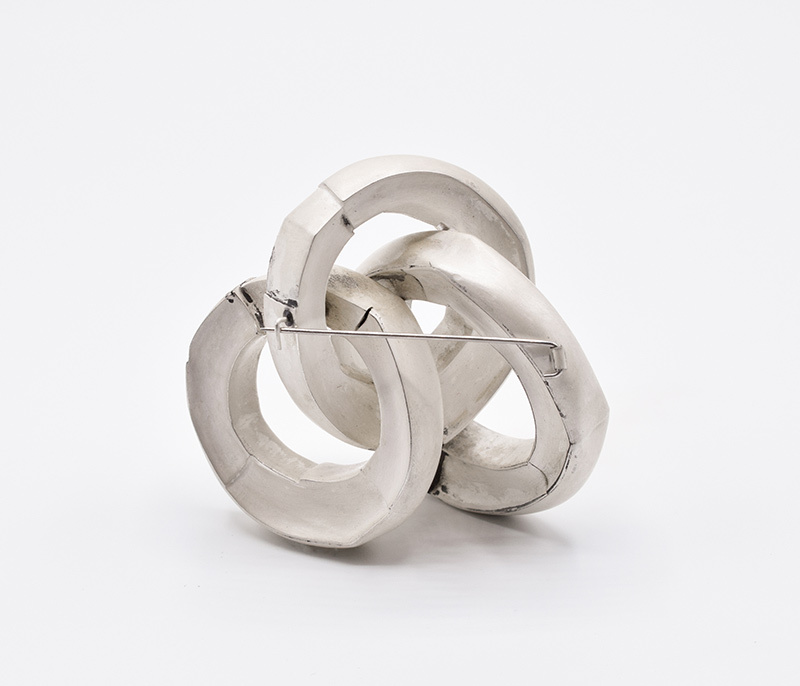 Rochester-based metalsmith/jeweler and arts professor Lydia Martin uses line to delineate how her facets of the hollow forms in her piece Shift “come together” into a fluid connection mechanism for her three intertwined hollow-constructed silver forms. In metalworking-speak, hollow construction is a means of creating both geometric or organic three-dimensional shapes by using silver or gold solder to construct walls of metal sheet to encompass the dimensional body of an object. This technique is also known as fabrication, as opposed to the historical method of metal construction commonly known as lost-wax casting. Martin is masterful with her sterling hollow constructions, as one can imagine the amount of soldering contraptions she must have needed to position these three circular elements in such a way to achieve the fluidity of the overall brooch forms. Additionally, Martin draws with her silver and gold solders to make the surface of her brooch forms have a two-dimensional life of its own. Deliberate oxidation or blackened patina from one circular plane of each object being connected to the other enhances the raw aspect of beauty within her hollow forms. Just as Lydia Martin uses line to allow her own geometric distinctions to emerge, my Upcycled Reimagined Gemstone Object No. 1 created for this exhibit embraces the 2-D lines of a gemstone’s geometric facets. Using Adobe Illustrator software, I reimagined what a new gemstone facet may look like, drawing lines with the pen tool and creating geometric planes that are output in color onto archival paper. As discussed in my previous post to artdoesmatter, I upcycle fibrous material from disposable microwaveable soup bowls and lids, a common consumer waste, into carefully crafted objects. Using all the same tools employed in studio metalsmithing techniques, I saw, pierce, score, drill holes and use sterling silver rivets or sew with thread to construct my oval 3-D object. I refer to my new raw material as a “socially-conscious ivory.” No genuine ivory is used, only the left-over fiber materials that I transform into personal adornments or petite objects instead of landfill fodder. 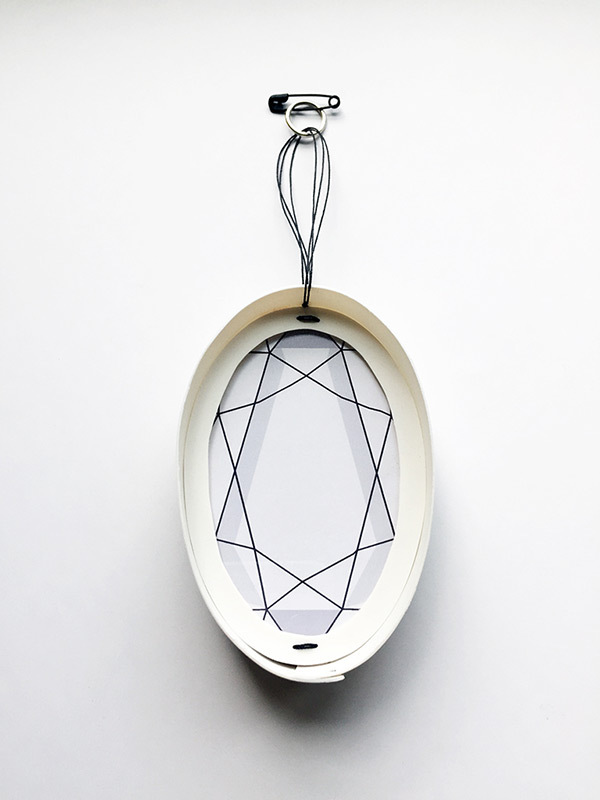 It’s the perfect process combination or amalgam of digital-meets-the-handmade. Reed Fagan, a metalsmith and arts professor currently based in Canada, embraces the geometric in his Cobordant Teapot in a more mathematically-true style. The term cobordant refers to a function in geometry where two different manifold spaces are mapped onto one manifold space (or vice versa.) 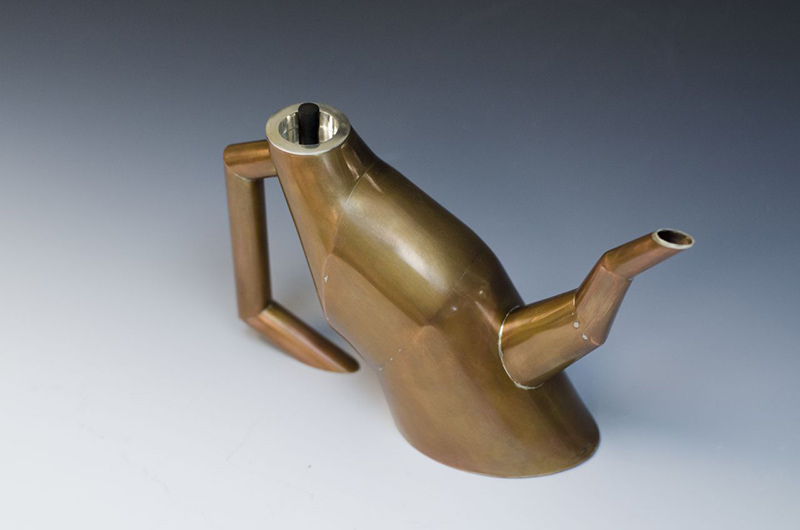 Fagan, who coincidentally studied math concurrently while studying metalworking as an undergraduate, appears to use a combination of raising metal with hammers and hollow construction to fabricate his teapot’s 3-D forms in sections. Reflective angles of copper sheet metal are joined in such a rhythm that one could imagine how convincing his forms can be that all teapots are “born” this way naturally. In this bending of angles and silver seams, Fagan is skillfully fooling his viewer into believing that a teapot can engage in this rhythmical movement all on its own. Fagan uses the silver solder line to “draw” on his surfaces as a decorative element as if the metal was being scored apart – not simply only a means to constructing the metal parts of the teapot together. The concave silver lid with cylindrical ebony handle hearkens back to the historic Scandinavian holloware designs of the early 20th century. Fagan, just like Lydia Martin and myself, infuses his own persona into the object while embracing his own differing aspects of his handmade object’s geometric styles. Articulating Craft is now on view at the Arts Center Gallery located on the campus of Nazareth College at 4245 East Avenue in Rochester, New York. The exhibition continues through March 1st, 2019. All images used appear courtesy of the artists and Nazareth College Arts Department. Hi. You know, I like the simplicity of your design and the way that the sides of the rectangles bow in a bit at their middles. Very elegant. Are you going to go to the college to give a talk? Neil, you may not believe this, but when I quickly glance at my own piece, all I see is the oval. However, now I see exactly what you mean, and it must be a “left-side of brain” working thing – because those black-line rectangles you’re referring to in the “gem” art are so apparent to me now. How could I be soo consumed w/ just the oval overall?! So thrilled you stopped in and gave me feedback! So far, no plans for an artist talk at the college, but I wouldn’t say no. The curator of this exhibit is truly such an inspiring artist herself (I’d have to sure bring my A-game!) Thanks so much, Neil! That’s some well written and informative text Patricia. Are you the writer and is it for the show’s catalogue? John, that is a supreme compliment coming from an artist and blog writer such as yourself! Actually, I do wish there was a budget for a exhibit catalogue this time around; but let’s just say this little post is my summary/highlights of what is a really great group of 37 artists w/ work in one place. I always welcome your comments and visits – thank you so much John for stopping by today! You made my day! Patricia, you have given us a fascinating insight into the physical aspects of the work and workmanship as well as the dreaming of the artists. What a leap you have taken in creating a virtual gemstone! And using up-cycled materials. To me, the theme of “articulating craft” includes not only communication but abutting edges and joining materials together. That probably goes without saying, but as you described the construction of these three pieces it became clearer. Your work uses un-like materials and your challenge to refine and assemble them has been elegantly resolved. I am also struck by the contrast in the apparent fragility of Martin’s piece and yours, with the robust defiance of Fagan’s work. Congratulations Patricia on your beautiful creation and a really interesting glimpse into your world. Philippa, once again, you’ve given me some special “food for thought!” Cannot agree more w/ your theory that “articulating craft” is not just the concepts and communication of it, but how materials are brought together and merged into a lasting object. Last evening, I received a notification that it is the seventh anniversary of my “artdoesmatter” blog. I genuinely appreciate you sharing your valuable feedback with me through these past 7 years! It’s always a great discussion whenever you are present!! First of all, congratulations Patricia! Your work is being showcased again, this is quite impressive. My Google search (I wish I could visit!) told me that the Arts New Media Gallery is a perfect venue for artists – like yourself – pushing boundaries and exploring new ways of working within their medium. What I appreciate and enjoy about your piece is that it is experimental, socially conscious and relevant, but also quite personal, poetic even, and above all impeccably crafted. Thank you for your blog posts – I always learn a lot from them: discovering work and artists I did not know, and challenging me to think about metal work in whole new ways. I am always reminded of why I love this medium (jewellery)! Oh Dominique! I’m soo happy you stopped by today! I know the academic year is in full-swing for you and your students. It really means so much to hear your feedback. I know you can appreciate what a fab show of both high craft and metal this exhibit truly is!! Also thank you for ‘being here’ for me since the early days, as I celebrate my seventh anniversary on artdoesmatter! Hope you’re well and the winter in Vancouver right now isn’t as harsh as we are having over here back East. Happy New Year to you and thanks again!! You’re welcome, Patricia, I really enjoyed my visit. And congratulations on your blog; I look forward to the next seven years! As for the cold, Vancouver has been spared so far, daffodils are already peeking out (sorry!). Stay warm and take care. Patricia it is always good to see the type of work you do and especially when you are involved in a show, I get to see your work. I have to say with regret, it has been a while since I have been on WP, so it took me awhile to get even this (my comment) right. After saying this, I think I should post, don’t you? Maybe you’ll get me back in the habit. Love you, Hollis. It’s clear from how you write that you treat these non-precious materials with the same attention, care, skills and techniques as you would precious metals/gemstones. That’s something to love, in itself, that respect for the craft and anything involved in it, regardless. Then I clicked on the photo to see it without any words around it and I just sat to look at it for a while. The lines of the gemstone are very present, but most of all, I came to think of how the oval shape reminds me of the frame of a portrait. And that’s what I camet to see here: a portrait of the artist, embedded in this piece. A portrait of someone who handles her art, her skills and her environment with respect, and with an open mind. Don’t know if this makes any sense, but this is how your piece resonates with me! Gunilla, why do you think I jumped over to your blog and mentioned how your posts seem to follow in-kind to what I was writing about in the works here?! Your commentary is well-worth the wait!! Yes, you definitely are right on-target w/ the oval framing device appearing to you, portrait-like and with respect to the “frame’s” content. I seem to gravitate towards taking an object, or in this case, a mere software line-drawing of an oval gemstone – and preserving it in some sort of frame. Even one made from tossed-off soup bowl fiber. Thanks so much for coming by to share your highly-observant and welcomed feedback w/ me.